It’s Week 17 of the NFL season, which for the Seahawks means one more regular season game at San Francisco before they begin postseason play for the fifth consecutive season. And since it’s Tuesday, that means it is time once again to answer questions from you, the fans. As always, thanks to everyone who took the time to submit a question this week, and apologies if we weren’t able to get to yours this time around. How did KJ Wright get the Spider-Man nickname? *A: *Wright’s Spider-Man nickname dates back to when Ken Norton Jr. was the team’s linebackers coach, and it has everything to do with the strongside linebacker’s instincts. Wright possess all of the usual physical traits teams look for in a linebacker—he’s big and fast and athletic—but what really helps set him apart is the way he can diagnose a play before it happens. Teammate Bobby Wagner has called Wright the “screen master” for his ability to sniff out a screen and blow it up in the backfield, and linebackers coach Michael Barrow, among others, has referred to Wright as Spider-Man after the Marvel Comics character whose “spider sense” allows him to detect danger before it happens. @KBottom2, @Natercom and @baterang2000 all ask about what seed the Seahawks could end up with in the postseason and who they might play. A: The Seahawks, who have clinched the NFC West and with it at least one home game in the playoffs, can still finish as high as the No. 2 seed, which comes with a first-round bye, and as low as the No. 4 seed. With a win at San Francisco Sunday, the Seahawks will finish as either the 2 or the 3 seed, depending on what Atlanta does in its game against New Orleans. If the Seahawks win and the Falcons lose, Seattle is the No. 2 seed, while if the Falcons win, they get the No. 2 seed. Seattle would be the No. 4 seed with a loss to San Francisco, meaning a home game in the Wild Card round against the New York Giants, who are locked in to the No. 5 spot. Obviously if the Seahawks do get a bye, their next opponent won’t be known until after the Wild Card round, but if they are the No. 3 seed, they would host the No. 6 seed in the Wild Card round. Heading into this weekend, three teams—Green Bay, Washington and Detroit—could all finish as the No. 6 seed. @BellCowBack, @danimichlson00, @Brwndwg and @NintraAa all ask about Jimmy Graham’s lack of targets over the past few games. *A: *This has for the most part been a very productive season for Jimmy Graham, who through 15 games has 859 receiving yards, the most by a tight end in franchise history, and six touchdowns, as well as a 14.1 yard-per-catch average that would match a career-high. But over his past three games, Graham has only four catches for 90 yards and a touchdown. As a result, plenty of people have been wondering why the ball isn’t going Graham’s direction more often, and while the answers to questions like that are above my paygrade, Graham’s production is a topic Seahawks coach Pete Carroll addressed Monday during his weekly appearance on 710 ESPN Seattle. @TilenL and @Jannis140 ask if the Seahawks might sign a receiver to take Tyler Lockett’s spot on the roster. *A: *These questions came in ahead of Tuesday’s roster move, but if you missed it, the Seahawks placed Lockett on injured reserve as expected, and promoted Kasen Williams from the practice squad to fill the open roster spot. Who is going to be handling the kick and punt returning duties now with Tyler Lockett out? @HolliWinters and @aarikaG ask who will take over return duties with Tyler Lockett out, while @aCrawfordz asks about return duties as well as who will step up at receiver. *A: *When it comes to the receiver rotation, Paul Richardson is expected to step into the role as Seattle’s No. 3 behind Doug Baldwin and Jermaine Kearse, and Tanner McEvoy figures to see a bit more playing time as well. “He did a very nice job in the game and came through for us for some big third-down plays and a big touchdown catch and all of that,” Carroll said of Richardson, who scored his first touchdown since 2014. “He really jumped at the opportunities, which is so often our case that we see our guys do that. When you give them a shot, they come through and they do something, and I thought Paul really responded beautifully for us." As for Lockett’s return duties, Richardson took over as the kick returner in Saturday’s game, and could stay in that role, Carroll said. Another option could be running back J.D. McKissic, who just signed with Seattle last week and was inactive for Saturday’s game. McKissic spent most of the season on Atlanta’s practice squad, but returned a kickoff 101 yards for a score in the preseason. Richard Sherman was the punt returner on Arizona’s lone second-half punt, though Carroll did not say whether or not that will be the plan moving forward. *A: *This question, along with “when will the Seahawks play in London?” is one of the most frequent in these Q&As, and I understand the reasoning—those old Seahawks uniforms are sweet. But unless the NFL changes its uniform rules or the Seahawks give up wolf grey, throwbacks aren’t happening anytime soon. The NFL allows team to have one alternate to their regular home and away jerseys—other than color rush—and since 2012, that has been wolf grey for Seattle. And even if Seattle were to give up wolf grey and decide to do a throwback, the helmet is another issue. For safety reasons, the league doesn’t allow teams to change the helmet shells during the season—the facemask or decals can be switched out. So unless the Seahawks were going to repaint all of their helmets silver for one game, wearing throwbacks would mean having a royal blue jersey and a navy helmet, which would look kind of weird. *A: *The good news for the Seahawks is that when Carroll was asked about Rawls on Monday, he said, “I think he will end up going.” But to answer the question, based on what we saw after Rawls left the game, it would appear that Alex Collins would be the next man up. The rookie out of Arkansas saw his most significant playing time of the season in the second half of Saturday’s game, and carried seven times for 28 yards. @MUT_12s and @jarjarsky ask if C.J. Prosise will be back for the playoffs. *A: *While the status on Prosise is still not certain, Carroll did say last week that the rookie back still has a chance to get back from a fracture scapula in the postseason. A: I’m lumping all of these together because in a way they’re all related. The Seahawks are in the playoffs and they’ll get at least one game at home, so yes, they’re contenders. And as that win at New England so clearly demonstrated, the Seahawks are good enough to beat anyone, anywhere if they’re playing well. But to the question about consistency, the Seahawks have had their struggles at times this season, particularly on offense in a few games. Carroll talked about that topic quite a bit Monday, noting that his team has struggled in the first half of its past two games while putting up big second half numbers. Team photographer Rod Mar shares behind-the-scenes images from the Seahawks' Week 16 game against the Arizona Cardinals on Christmas Eve at CenturyLink Field. 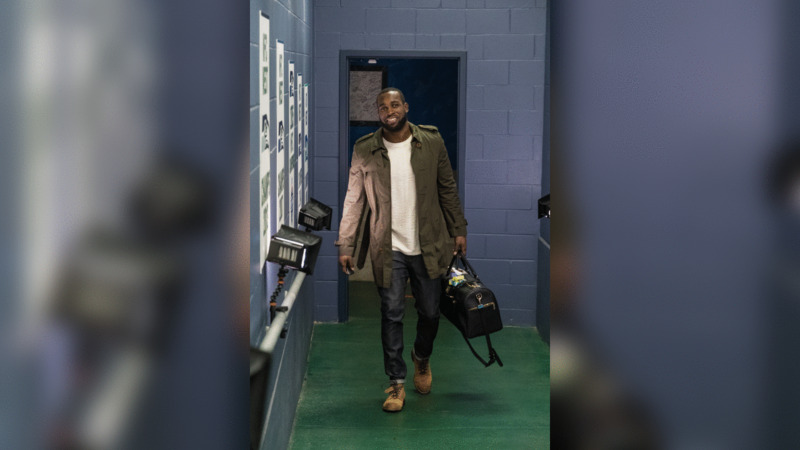 Kam Chancellor arrives at CenturyLink Field for the Week 16 contest against the visiting Arizona Cardinals. Receivers Paul Richardson and Tyler Lockett chat in the locker room before early warmups. Tackle Garry Gilliam stretches on the field two hours before kickoff. Russell Wilson listens to music on his Bose headphones during his pregame ritual. Head coach Pete Carroll plays catch before the players arrive on the field for early warmups. Fans greet players as they emerge from the locker room for pregame warmups. Tight end Luke Willson listens to position coach Pat McPherson in the locker room before kickoff. Safety Kelcie McCray prepares to take the field with the rest of the defensive backfield. The defensive backs get pumped in their pregame circle. Offensive tackle George Fant waits for his name to be called during pregame introductions. Quarterback Russell Wilson confers with head coach Pete Carroll in the locker room just before the team took the field for kickoff. A member of the military helps hold the American flag aloft during the playing of the national anthem prior to kickoff. Defensive lineman Frank Clark gets focused before taking the field. Ahtyba Rubin tackles Arizona's David Johnson early in the contest. Michael Bennett celebrates a sack of Arizona quarterback Carson Palmer in the first quarter. Safety DeShawn Shead yells after tackling Arizona's David Johnson. Seattle's Marcel Reese looks to recapture a fumble in the first quarter that led to a turnover. The Sea Gals were dressed in holiday style for the Christmas Eve game. Tyler Lockett finds room on the outside as he looks for yardage. Seahawks quarterback Russell Wilson looks to escape pressure from Arizona's Calais Campbell. Tyler Lockett has a potential touchdown pass batted away by Arizona defenders in the first quarter. Seattle's Doug Baldwin is tackled by Arizona's D.J. Swearinger in the second quarter. Seattle's Bobby Wagner briefly grasped the helmet of Arizona's David Johnson before making the tackle. Arizona's J.J. Nelson races for a touchdown after getting behind the Seattle defense in the second quarter. Russell Wilson dances his way upfield, scrambling away from Arizona's Josh Mauro. Seattle's Doug Baldwin gets behind the Arizona defense for one of his 13 receptions in the game. Seattle head coach Pete Carroll comforts receiver Tyler Lockett, who was injured near the goal line after a reception in the second quarter. Seattle receiver Tyler Lockett signals to the crowd as he is helped to a cart to be taken off the field after injuring his leg in the second quarter. Seattle's Cliff Avril reaches out and strips the ball from Arizona's David Johnson, resulting in a turnover recovered by the Seahawks. Quarterback Russell Wilson greets teammates as they return to the locker room at halftime. As part of halftime festivities, the family of U.S. Army Sergeant Scott Young watches a video message from him. Sergeant Young is currently stationed in Iraq while his family lives in Tacoma, WA. Upon realizing that U.S. Army Sergeant Scott Young was in the stadium for a surprise greeting, his family races to meet him. The family of U.S. Army Sergeant Scott Young mobs him on the field during halftime as he is reunited with them for the holidays before returning to his deployment in Iraq. In the second half, Alex Collins got the call, and found yards against the Cardinals defense. Receiver Doug Baldwin leaps high but a pass in the end zone is batted away. Receiver Paul Richardson saw extended playing time in the absence of injured teammate Tyler Lockett. The Seahawks assistant coaches react to a touchdown by Seattle's Jermaine Kearse in the third quarter. Jermaine Kearse lets out a yell after scoring a touchdown in the third quarter. Seattle's Jarran Reed muscles down Arizona's David Johnson in the third quarter. Seattle's Russell Wilson fires a pass in the second half. Seattle's Doug Baldwin scores in the fourth quarter on a 42-yard reception from Russell Wilson to cut Arizona's lead to three at 21-18. Receiver Doug Baldwin kneels and prays in the end zone after his touchdown in the fourth quarter. Seattle's Jimmy Graham races for the end zone. Seattle's Jimmy Graham tumbles into the end zone at the end of a 37-yard TD reception late in the fourth quarter. Seattle defenders K.J. Wright, Cassius Marsh and Bobby Wagner celebrate a stop. Paul Richardson takes a bow after his two-yard touchdown reception tied the game at 31-31 with 1:00 remaining in the game. Michael Bennett tries valiantly for the block, but Chandler Catanzaro's field goal as time expired was good, giving the Cardinals the victory. Seattle's Justin Britt congratulates Arizona's Larry Fitzgerald after the game. Head coach Pete Carroll talks to his team in the locker room after the loss. More than an hour after the game, linebacker Brock Coyle walked across CenturyLInk Field with his longtime girlfriend Brooke. Waiting at midfield was a table with memorabilia from their relationship and a marriage proposal from Brock. She said yes, as friends and family watched from afar.